Review: The Knights, 'Azul' One of the finest, most ravishing, cello concertos so far this century, written for and performed by Yo-Yo Ma, finally receives its debut recording. Why Azul, one of the finest cello concertos so far this century, had to wait more than 10 years to appear on an album is confounding. It was written in 2006 for one of classical music's most beloved performers, Yo-Yo Ma, by one of today's most popular composers, Osvaldo Golijov. Such are the perennial mysteries of the classical music recording industry. Thanks, then, to The Knights, the enterprising chamber orchestra from Brooklyn, and Warner Classics for finally presenting this magnificent score in an affecting collaboration with its dedicatee, surrounded by a diverse mix of works from Sufjan Stevens, Stockhausen (via Caroline Shaw), Dvorak and the orchestra's own Colin Jacobsen. Azul (Blue in Spanish) is a perfect fit for Ma and he plays as if entranced. His never-ending thirst for global music clicks with the score's multi-cultural pedigree. Golijov was born in Argentina to Eastern European Jews and educated in Israel before moving to the United States. You never know when a snippet of tango, gypsy or klezmer music might break the surface. The lush score, in four movements, includes room for a little band within the orchestra consisting of a hyper-accordion (souped up with digital processing) played by its inventor Michael Ward-Bergeman, and a battery of exotic percussion dispatched by Cyro Baptista and Jamey Haddad. Azul opens with undulating waves of low strings, laying a foundation for Ma's soaring cello. The music searches, reaching ever higher, whirling itself into ecstasy, and finally falls back to earth into a pool of percussion. The slow movement begins in serene meditation — a heartbeat pulse in the strings, birdsong percussion and sustained cello pitches — but it gradually blooms into a sweet thunder of brass and winds. "Transit," the third movement, takes us places, starting somewhere in the land of Bach's Cello Suites (powered by expressive arpeggios), stopping off for a folk dance and ending with an eruption. Its aftermath leads seamlessly to "Yrushalem." The surging breaths from the beginning return, and Ma spins the melody into an aching song. The music rises to a brass-filled climax, ending in a pair of codas, titled "Pulsar" and "Shooting Stars." The first explodes with the force of a supernova, while the second traces the stardust as it quietly disperses across the galaxy. 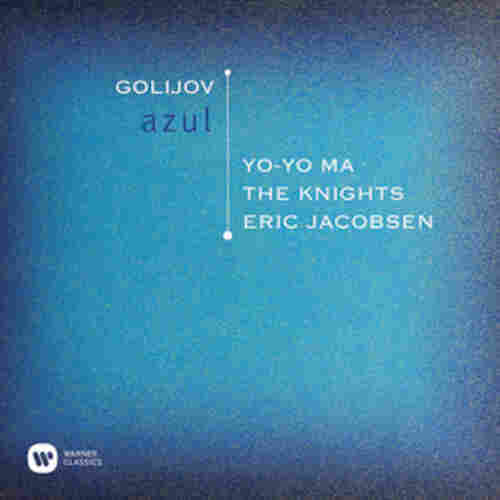 Next to the rambunctious St. Mark Passion, Azul is Golijov's masterwork, and arguably should open the album. But The Knights program the recording like a concert, instead beginning with Ascending Bird, a Persian folk tune reworked to ecstatic effect by the orchestra's principal violinist Colin Jacobsen and Iranian musician Siamak Aghaei. Solos for Ma and Jacobsen mimic the Persian kamancheh until the melody itself breaks through and the orchestra takes flight in a chugging beat, rising to rapturous heights. Ma also gets tapped for "Song to the Moon," the hit aria from Dvorak's opera Rusalka, in a straight ahead arrangement for cello and orchestra. Two other arrangements fill out the album. Pulitzer-winner Caroline Shaw's effervescent arrangement of music by Karlheinz Stockhausen continues the album's celestial theme. "Leo," one of Stockhausen's 12 quirky Tierkreis (Zodiac) pieces is retooled for violin, winds, brass and percussion, while Knights horn player Michael P. Atkinson creates a 15-minute suite for strings from Sufjan Stevens' Run Rabbit Run. Most of the music darts about leaving fragments of melody, but the third movement, "Year of Our Lord," reminds us what a superb sensualist Stevens can be. With its long, elastic lines and Barber's Adagio harmonies, the movement is safe harbor amid the frenzy, and stretches out slowly toward some kind of eternity.